The Institut für Textilforschung der RWTH Aachen (ITA – Institute for Textile Research) at RWTH Aachen University and Lucem GmbH in collaboration has proverbially brought light into the dark season. 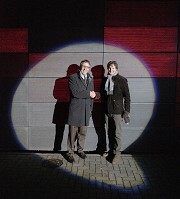 The director of the ITA, Prof. Thomas Gries, and the General Manager of Lucem, Dr. Andreas Roye, presented the first translucent concrete façade to the world 6th December. Translucent concrete describes matt-transparent, thus light-transmitting precast concrete elements. Prefabrication is absolutely necessary for these elements owing to structural reasons. For this purpose, optical fibres are embedded in fresh concrete. After hardening the concrete block is cut to pieces by means of a stone-cutting saw, so that all optical fibres transmit the light through the concrete without loss. BFT INTERNATIONAL reported extensively on this innovation already. The translucent concrete wall covering a surface of 120 m² which has now been inaugurated, decorates a new experimental hall of the ITA in the western extension of RWTH. It consists of 136 individual elements measuring 500 x 150 cm with a thickness of 20 mm each. The translucent concrete layer has no insulation function; it is rather the ventilated external cladding of a curtain wall. The elements are illuminated with the aid of diffuser plates fixed behind them, which are illuminated with RGB LEDs (multicolour white light-emitting diodes) that are switch able in the range of nanoseconds. All 136 light elements are selectable via a digital control system. In this way, it is possible to create any kind of graphical light effect. For Prof. Gries, it was important to emphasis that the perceived coarse appearance of the elements was not a problem of the concrete matrix but rather of the control electronics behind it. Because any illuminated surface does not only need al LED unit and a diffuser but also several control cables which must be led there. The system has to be considered as an experimental project which still has to prove its fundamental serviceability. However, Gries and Roye do not intend to exclude the option to replace the control system applied in the background in favour of one with a finer resolution once in future. Basically it is quite conceivable to show even photographic illustrations on such surfaces in the future. Contrary to the light-transmitting concrete (Litracon) presented in depth in 2005, the optical fibres of the product Lucem Line are not embedded manually as thin bundles on which concrete is bailed layer by layer. Here, instead, 1,000 fibres are laid at once over a so-called creel into the formwork. – A common method in textile industry being derived from automatic weaving of panels of fabric. This method also allows manufacturing remarkably larger basic elements, which is more cost effective. For the ITA façade they were measuring 1.50 x 1 x 2 m. All elements for the shell construction were cast in the factory at first and were then, after hardening, carried to a concrete block factory for cutting. After cutting, the surface of translucent concrete can be finished like that of any other precast element. Neither polishing nor acidulating poses any problem. Beside the machine-made product “Line”, Lucem also offers manually made translucent concrete under the name of “Label”. The product allows arranging the optical fibres in individual patterns. Although the method is very expensive. Therefore, Roye recommends using an industrially manufactured translucent concrete: This simply ought to be furnished with a light-transmitting negative foil and illuminated.